ADVANCED DELIVERY DEVICES - Innovation Without Change: What is it & What Can it Mean for Pharmaceutical Manufacturers? ADVANCED DELIVERY DEVICES – Innovation Without Change: What is it & What Can it Mean for Pharmaceutical Manufacturers? A third generation of “passive” devices emerged, whereby the safety mechanism automatically engages after the injection. These products address previous issues but have drawbacks. Most add an exterior structure to the syringe, which can be obtrusive, cause anxiety, and impair visual inspection of the syringe contents. Due to the potential for premature activation of the safety mechanism, these designs often require user retraining or are incompatible with conventional techniques, such as purging air bubbles, performing aspiration, or reconstituting powders. Other passive products require significant changes to the drug’s primary package. WHAT IS INNOVATION WITHOUT CHANGE? Innovation Without ChangeTM is a product design and business partnering philosophy that shifts the paradigm so that drug companies no longer have to make a bad compromise between the advances that innovation offers and the time, cost, and risk associated with those innovations. By offering the innovation of the final device without the traditional changes that require substantial development, regulatory effort, and supply chain risk, Innovation Without Change addresses both the end user performing the injection and the path to commercialization for the pharmaceutical manufacturer. The Credence Companion Safety Syringe System was born from this core philosophy. Innovation Without Change incorporates a modular approach to the device design, leaving the primary package unchanged. This basic tenet has the dramatic impact of simplifying the commercialization path, reducing supply chain risk, and providing manufacturers enhanced flexibility to respond to market changes. Drug manufacturers have complete freedom to choose the critical primary package components from any vendor(s) they choose. They select the syringe, plunger/stopper, and tip cap components that are ideally suited for a specific drug, and the filling process is completely unaffected. 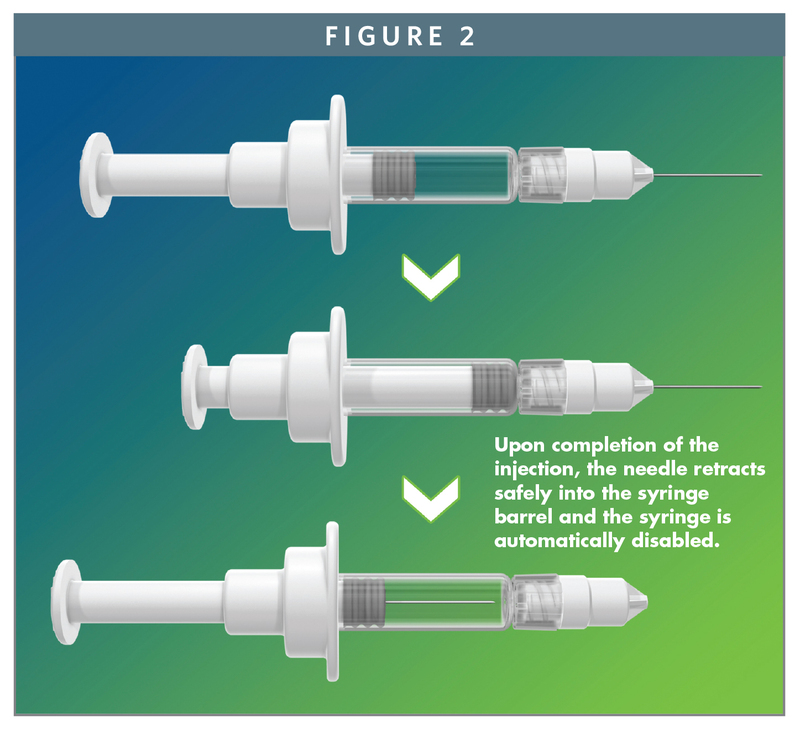 The Companion plunger rod and Flex Finger Flange are added to the syringe in the common secondary assembly process; the needle is either included in the kit in the luer presentation or already affixed to the syringe in the staked presentation (See Figure 1). While the Companion takes the novel modular approach of building integrated safety into an existing primary drug container, the concept of modularity is not new to the industry. Modularity has been available in the design of the primary package for years, with choices including the selection of syringe/drug container, lubrication, needle size/type, stopper, tip cap/needle shield, finger flange, and plunger rod.5,6 Innovation Without Change builds on this modular concept by providing the delivery device with flexibility in the features selected. The result is an innovative device that provides marketable differentiation, life cycle management options, product line flexibility, and full compliance to safety legislation, all without changing the primary package. The Companion offers the best in anti-needlestick technology, fulfilling OSHA’s recommendations for needled device compliance. It has fully integrated passive safety features, provides audible, tactile, and visual cues, allows single-handed operation with the user’s hand remaining behind the needle, and is automatically disabled after use (See Figure 2). It is designed to be familiar to the end user, allowing routine manipulations of the plunger rod for air bubble removal, aspiration, and reconstitution techniques, full visibility of the barrel and drug product, and comfort in employing all common hand positions. But what else can Innovation Without Change mean for our pharma partners, patients, and caregivers? Changing a drug’s primary package can cost several million dollars and extend from 6 to beyond 36 months.7 The validation work includes container closure integrity, sterility, biocompatibility, stability, extractables/leachables analysis, reformulation, etc. The effects on the safety and efficacy of the drug must be assessed via an understanding of the impact on the molecule’s strength, quality, identity, purity, and potency.8,9 This change is designated by FDA as requiring Prior Approval before implementation and can necessitate changes to the filling line and manufacturing facility. Maintaining the existing primary package simplifies the path extensively, eliminating costly and timely variables that add risk along the way. The industry and its consumers have benefitted from advances in the critical primary package components by leading suppliers that have the required expertise and capacity to provide reliable supply. Credence embraces this expertise by building the Companion with the versatility to work within the tolerances of these existing components. This provides pharma manufacturers the flexibility to choose their preferred components and multi-source from their preferred vendors. But Innovation Without Change extends from the product’s design to Credence’s partnering business model and the supply chain flexibility it provides. Just as the Companion allows a drug company to avoid changing from its preferred package, Credence’s partnering approach allows a drug company to maintain important supplier relationships with its molding and assembly partners. This extends the multi-sourcing option to components of the Companion and capitalizes on the existing effective relationships with preferred vendors, thereby further reducing the risk of supply chain interruption. The highly regulated environment has made it challenging for pharmaceutical manufacturers to respond quickly to changing external factors. The modularity and inherent flexibility of the Companion’s design, in conjunction with forward thinking regulatory strategies, can provide newfound adaptability to changes in legislation, regulatory requirements, market trends, competitive actions, etc. For example, different user populations have different device preferences. 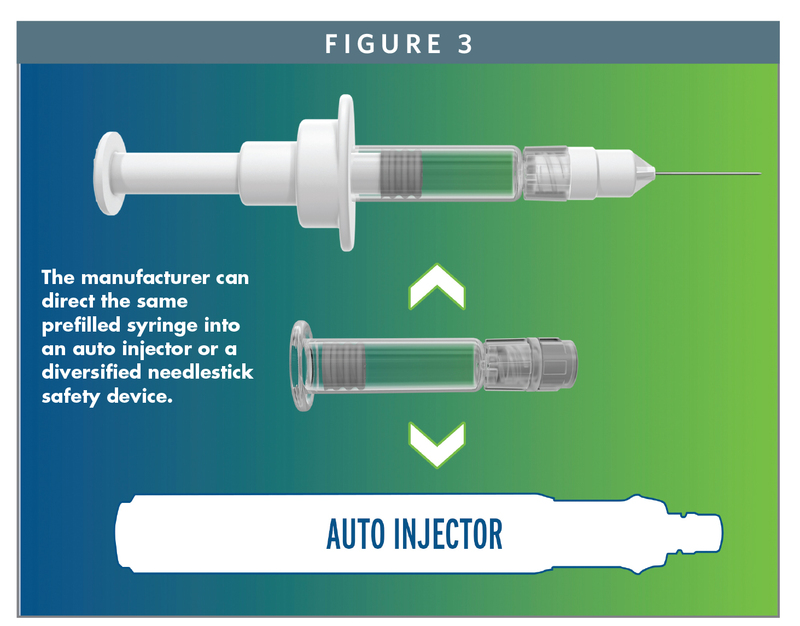 A small study shows user preference for a prefilled syringe compared to an auto injector ranging from 33% to 67%, depending on the disease state.10 The ability to direct a sterile filled drug container into an autoinjector or into a differentiated needlestick prevention safety syringe gives a drug company efficient flexibility (See Figure 3). Similarly, though developing nations have different economic realities than developed markets, they have a great need for needlestick prevention and syringe disabling technology. Once again, the modularity of the Companion provides a viable solution. By changing the plunger rod, a drug company can provide more viable markets with passive needle retraction, while providing developing markets with active retraction. The drug company gains the flexibility to provide needlestick safety and single use technology to both markets while differentiating the cost of goods. Further, as needlestick prevention legislation expands to new geographies and new points of care (the home? ), the ability to gain compliance and a market edge by building off of the existing drug container becomes critical. Prior to Innovation Without Change, this flexibility was much more difficult to attain. Human factors improvements are often left behind when delivery system innovations don’t make it to market, despite the fact that they can promote more accurate dosing and more efficient healthcare. By simplifying the commercialization path, the Companion facilitates getting important improvements into patient and caregiver hands. For example, the Companion’s user has full visibility of the syringe barrel and drug product and can perform standard air bubble removal and aspiration techniques without fear of prematurely engaging the safety mechanism. Further, the flexibility of Innovation Without Change allows customization of the thumb pad and finger flange, whether the goal is to maximize user comfort or minimize footprint. Needles represent another area of human factors focus. Long needles, such as those used for intramuscular injections, have been largely ignored by safety technology suppliers due to the challenge of passively protecting them, yet, these long needles may be the most dangerous. Perhaps due to the lack of adequate safety, long needles are not being used when they ought to be. Of the medications with an intramuscular route of administration, it is estimated that few women and about 15% of men actually receive the drug in the intramuscular space because the needle being used is not long enough.11 This is an area where a luer needle can have a major impact; the Companion’s luer solution allows the right needle to be selected for the specific patient, and it also provides passive needle retraction for any practical needle length. But traditionally, luer needles have been susceptible to improper connections between the needle and the syringe, resulting in complaints of spilled drug product, inaccurate dosing, and needles left behind in patients. 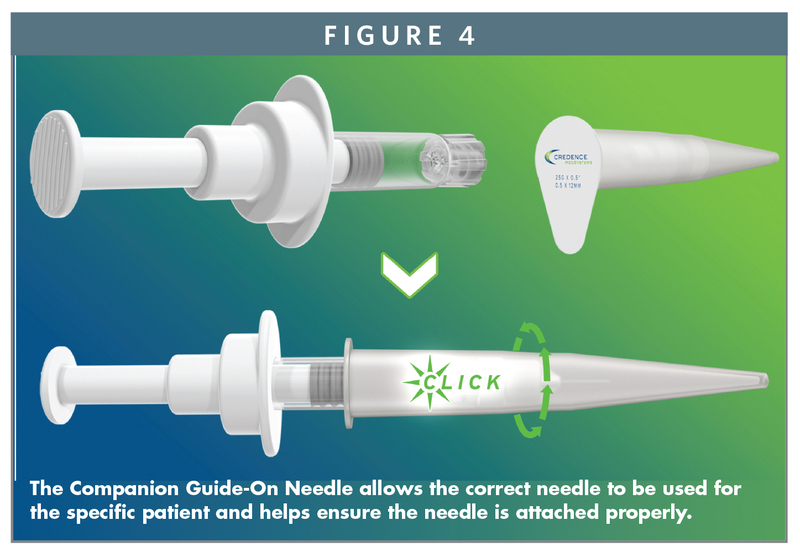 To address this, the Companion Guide-On Needle Cover provides the user visual, audible, and tactile cues of a successfully connected needle. Further, the cover cannot be removed from the needle until the user has twisted the needle on properly to a designated torque level. Therefore, the user is prevented from attempting an injection with an improperly connected needle (See Figure 4). This is extremely important in reconstitution applications where luer needles are required to provide a sharp needle for injection into the patient. The Guide-On Needle Cover helps ensure the needle is attached properly. Of further importance, the Companion can be used without fear of premature safety activation during the diluent delivery and subsequent drawing up of the reconstituted solution. These manipulations of the plunger rod often cause conventional safety devices to prematurely activate. 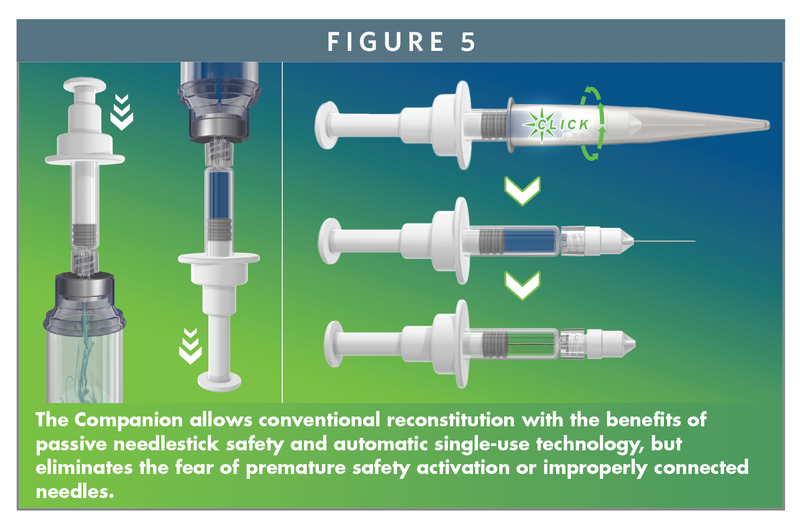 The Companion allows conventional reconstitution with passive needlestick safety (See Figure 5). Should the manufacturer wish to pursue a dual-chamber presentation, Credence’s Innovation Without Change approach can also apply. It allows the pharmaceutical manufacturer the freedom to choose the desired reconstitution approach while still employing the best in needlestick safety. If the pharmaceutical manufacturer wishes to employ a staked needle because neither needle choice flexibility nor reconstitution is needed, the Innovation Without Change design philosophy can also allow this choice. The user experiences the same passive needle safety and human factors benefits but does not have to attach a needle. The manufacturer can still choose its desired syringe, stopper, and needle shield primary package components, just as is done with the luer solution, and the filling process remains unchanged. Further, because adhesive is not present in the Companion system, a risk of undesirable interaction with the drug substance is removed. Innovation Without Change provides innovator companies a means of extending the life cycle of their commercial drugs by enhancing safety and usability, thus placing meaningful barriers to competitive threats from generic follow-ons. This strategy can also be employed to differentiate follow-on molecules from the innovator and has particular value for biosimilars. The FDA’s Proposed Guidance for Industry on Biosimilars allows for the potential use of delivery systems that are differentiated from those of the innovator product.12 Biosimilar manufacturers can therefore capitalize on recent advances in delivery systems and also differentiate on something tangible other than price. So whether it is the innovator providing barriers to the follow-on, or the follow-on differentiating from the innovator, the delivery device becomes a meaningful and valuable tool; Innovation Without Change allows the differentiation to occur without the development path complexity and sourcing risk traditionally associated with the effort. The modular approach also makes it easier for engineers and marketers to tailor the device specifically for the drug, user population, or brand. For example, specified colors or logos can be used, or the finger flange and thumb pad can be fashioned to provide a more robust interface. But Innovation Without Change can do something more revolutionary. As the trend toward home administration of injectable medications continues, home injectors will seek the kind of individual customization that is more typical in products from technology and consumer goods industries. Just as consumers select different covers and colors for their iPhones or will change backgrounds for their Apple Watches, what if consumer injectors could customize their safety injection device with à la carte component choices? Innovation Without Change provides the modularity needed for devices to be customized and built for individual tastes and preferences. When the modularity of the device converges with regulatory strategy vision and supply chain flexibility, the possibilities exist for the expression of “personalized medicine” in injection devices. A rigorous, risky development and regulatory process forces pharmaceutical manufacturers into a bad compromise between advances in delivery systems and the time, cost, and risk associated with those advances. Often, the choice is to forsake the advances, even if the expected benefits can include life-saving safety improvements and human factors enhancements that lead to safer, more efficient, and more effective healthcare. Innovation Without Change shifts the paradigm and affords drug manufacturers the flexibility they have not previously had. The Credence Companion Safety Syringe System, built around the foundation of an existing drug container and components, allows a modular “pick-and-choose” approach to the design of the delivery device. By minimizing the cost, time, and risk of commercializing their drugs with the Companion System, pharmaceutical manufacturers can incorporate the differentiating safety and usability features that their users need, that legislation requires, and that customers increasingly mandate. 1. Eakins M. Design & construction of prefilled syringes. Amer Pharmaceut Rev. 2007;10:47-51. 2. Fox DM. Politics of physicians responsibility in epidemics: a note on history. Hastings Center Report. April 1988. 3. Massachusetts Sharps Injuries Surveillance System, 2002-2011. 5. Eakins M. Prefilled syringes: state of the art and future requirements. Prefiled Syringe Forum, LaJolla, CA; June 2009. 6. Yoest LM. Fluoropolymer coated plungers for prefilled syringe applications. Prefilled Syringe Forum. LaJolla, CA; 2009.
supplement, API Synthesis and Formulation 2009). 8. Harapanhalli R, Vice President, ParExel. Presentation at Prefilled Syringe Conference, Iselin, NJ; April 2014. 9. FDA, 21 USC 356a, Sec 506 A, Manufacturing Changes (Bethesda, MD, 2009). 10. Drori H, Lewkonya G, Daily D. Safe Auto-Needles (SANs) Case Study: Market Research Uncovering Self Injecting Patients’ Unmet Need and Usability Study with Patients Using the SANs for this Unmet Need. Universe of Prefilled Syringes, Huntington Beach; October 2014. 11. The Pharmaceutics and Compounding Library, University of North Carolina Eshelman School of Pharmacy. http://pharmlabs.unc.edu/labs/parenterals/intramuscular.htm. John A. Merhige is Chief Commercial Officer at Credence MedSystems, leading the company’s business development, sales, and marketing strategies. 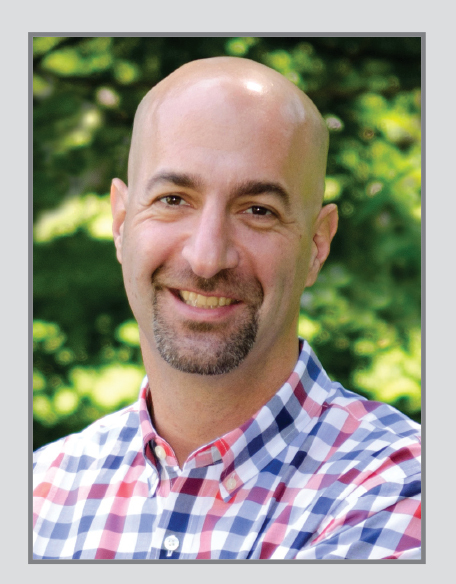 Previously, John was Vice President, Market Development at Sanofi BioSurgery. He joined Sanofi upon its acquisition of Pluromed, which he joined in its early stages and was a member of the executive management team. Previously, Mr. Merhige founded Prelude Devices to identify early stage medical device ventures and gained general management and commercial leadership experience at Ford and Avery Dennison. He graduated from Dartmouth College with a Mechanical Engineering degree and returned to Dartmouth for a Masters in Engineering Management from the Thayer School of Engineering and the Tuck School of Business. 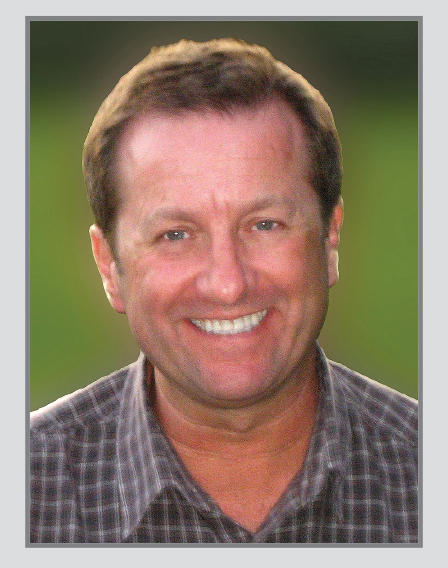 He is a member of MassMEDIC, MassBio, and has served on the Board of Directors of the MedDev Group (MDG). Dan Thayer is Technology Director of Credence MedSystems, where he uses his deep industry knowledge to further the company’s product development and intellectual property efforts. He is a successful entrepreneur and skilled problem solver. His experience includes ventures in the hospitality and auto industries; in the latter he performed as a racing and test driver for Toyota USA, GM, Mercedes, BMW, Anson, and Tiga race cars. More recently, Mr. Thayer has been focused on needlestick safety technology. His efforts have led to several technological breakthroughs designed to protect healthcare workers and patients.